I have posted a problem I have with SendToHTTP in this thread. I am informing you as well, in case it relates to your build. Newer versions (Black PCB) have 1MB and can be used with the 1024-Binaries of ESPEasy 2.0.0/Mega. At this time there are some ESP-01 with a PUYA flash chip. These flash chips do not work with ESPEasy atm, they have a problem with SPIFFS memory. This problem is under investigation, but that will take a while. There is solution, but we still have to implement it. I received finally the new 7digit modules with M1637 and new config (6 digits and with decimal dots). I will try to find some spare time to update the plugin to have support for them, about the SendtoHTTP bug I don't this can be connected but I'll have a look. Last edited by papperone on 12 Feb 2018, 08:43, edited 1 time in total. I received fiannly the new 7digit modules with M1637 and new config (6 digits and with decimal dots). That's weird as they both uses TM1637 and I build the plugin from scratch using the info taken from the IC datasheet, but... obviously I overlook something or the new display have something different which I cannot still spot. Anyhow I think it will take longer than expected as I will need to reverse engineer the new lib I've found to understand how it is driving the IC and to implement the same changes in my plugin (which does not uses any library). As you probably already knew, I cannot get mine to shine neither. Will dot matrix displays powered by MAX7216 be supported? Just curious. is this still on your to-do list? I think it‘s a good idea. The Dot Matrix looks very good. Yes it is! Right now I need to rework the TM1637 interface to enable compatibility with newer modules, then I'll work on implementing dot matrix displays! As there is a level potential issue on the displays (5V on arduino, 3V3 on ESP) I have ordered level shifters to check. Yes I have all new modules that does not work with my plugin while the modules I've boughy few months ago works perfectly. Nevrtheless on a bare ESP8266 with the original library I've the same behaviour while using a different library I'm able to drive both old and new type displays. I just wanted to add that I bought several of these units and unfortunately they also don't work with this plugin. There is no output visible. They work from Arduino or from Raspberry Pi. Weird, right? This PR fixes the No Display (+ also hangs, crash, etc...) issue for a recent (RobotDyn in my case) 4seg display, using a NodeMcu v2. - does it STILL work on older displays (that used to work with the previous code) or not? - is it stable (no over Load usage, or hangs) or not? - is it working with your recent displays? If it is reported to work on both old and new displays, maintainers will certainly merge it fast. Thanks for the proposed fix. Would it be alright to trouble you for the compiled firmware; i.e. would you be willing to post that somewhere? Preferably for a 4M-version ESP8266? It is already merged and there should be a new build tomorrow morning. Ah, right. I can confirm that my TM1637 units (the ones obtained here: https://nl.aliexpress.com/item/4-Digit- ... 69551.html) work. Thanks for fixing this! 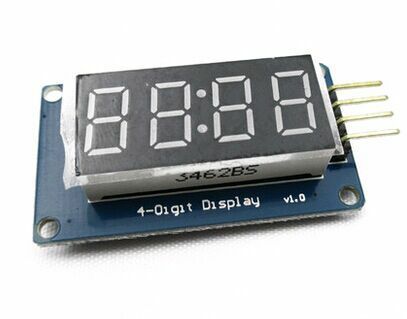 By the way, when I send "7dn,8.5", the display reads "8", where I would expect it to read "8.5". And when I send "7dt,8.5" it reads "8:5°", where I would expect "8.5°". Is my expectation wrong, or could this be an issue related to this specific module? Any thoughts? Thanks for the quick PR but I had already fixed the timing issue; I am still working to handle better this new display which has both "dots" and "colon" (that's causing the strange behaviour of last post from victorclaessen). Last edited by soif on 05 Mar 2018, 06:42, edited 1 time in total. yes, I know, so far i've got 4 different displays (I've received all of them so I can test all before to release next version). that it still works with my latest (merged) PR ? Long story short, module (1) and (3) behave exactly the same, so I removed module (3) from the drop down, already implemented module (2) and tested. I tried to commit the new version of the pluing into the 2.0 branch but for some reasons GitHub desktop still keep adding it to the HLW8012 PR which is pending since month waiting for a solution. Despite in GitHub I created a new PR when I try to merge it GitHUB (on the web) keeps adding anythign to the previously opened one. If someone can explain how I can make GitHUB desktop understand I really want a new commit separated from the pending one(s) it woudl be very apreciated!!! Can you have a look at this one to check I took the correct version? Then I will merge it. Thanks TD-er, really apreciated the help and sorry for the mess! @everyone: new P073 is on GitHub, supporting below modules; please test all modules you have and report to me eventually any bugs found. **NOTE** if your TM1637 4-digit module has both colon and dots most probably only colon is connected thus it will work same as the one described as "TM1637 4digit (colon)"
Please forgive me the bad code but those modules are really weird, most of them the digit addresses are in the right subsequencial order (e.g. 1234 or 12345678) but the ones 6-digits I've got have all swapped order "321654"
hello, I have tested this week end : wemos D1 with display 4 digit with colon & dots. It's works fine . thanks a lot for the development. I can manage the brigthness using the web interface but how can we manage the brightness by command (http/mqtt or Rules)? thanks a lot 38domo, can you please post a picture of your display to confim which one you tested? Is it possible to use multiple LED displays at once ESP ? I was thinking of copying the plugin and making the changes in the playground, but then I found this thread and I see that you've had to do some "interesting" stuff to make the code work with the different versions of the TM1637, so I thought maybe it would be better to suggest the changes to you and see if you have the time to make them, rather than for me to break something! - 7ds,"ABCD" for string data (e.g. hexadecimal or text)... the characters AbcdeFhIJLoPStuy should all be possible to create with 7 segments. What do you think, is that something you could do, or is it better if I learn how to modify the plugin and try my skills? 2) definitely yes, it was somethign planned to add alphabetical chars but still not done; I'll fin dsome free time to implement this new features and will take your suggestion but I'm puzzled what is the application for the "binary" feature you asked, can you please elaborate more? The "binary" idea was to allow any arbitrary pattern that the user might want to display - maybe "=", three bars, two vertical bars, etc. The controller chip takes 8 bits of data per digit, so I was thinking that those could be encoded by the user/user code into a 1-byte number (0-255) and then 4 (6, 8) of those passed to the plug-in which would simply send on the bit patterns to the display chip. That said, if we extended the alpha character set to include "=", "-" and "|" then I can't really think of any other patterns that one could make so the binary probably isn't going to add anything! I was trying to apply MAX7219 along with the encoder, I wanted to display time, date, temperature, humidity in the room and temperature and external humidity, taking data from another module. I can use the rules to display rotating encoder temperature and humidity (without the letter) but I do not know the command to display time and date, if in the rules impose% syshour%, %sysmin% or %systime%, does not happen as clock set in device, what is the correct command? I noted this as new future fature to implement in next release, thanks! For those using the 8-digit display could you put two values together, for example temperature and humidity? Thank you again for the work you are doing. Thanks to your work I'm creating a bedroom object rack.Only a question, as regards the text will it be possible to merge it in the same string of a value, such as humidity alongside an H?